CLICK HERE to order Leather Jacket. 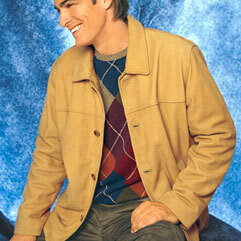 The classic hip length leather jacket constructed of soft, supple full grain leather. Button front closure and side-entry pockets, two interior breast pockets and lower cell phone pocket. 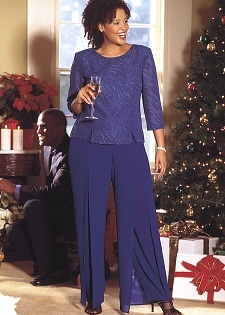 CLICK HERE to order Holiday Pant Set. Don't you love walking into a party knowing your outfit's fabulous? And this one's just as dazzling even when the holidays are past. Wear it to any gala event for glamour all year 'round. Sleek top falls 25 inches long, with vented hem for smooth fit. Shimmer threads create gorgeous glow. Princess seams provide flattering shaping. Padded shoulders slim your silhouette. Fluid pants flutter gracefully with each step you take. Full-length split overlay covers pant legs for stunning effect. Pull-on elasticized waist feels comfortable all evening long. Both pieces: lightweight pebble crepe in 100% polyester.